I have for you a pretty and quite feminine bookmark. It has a magnetic lock, so it adheres to the book very well. I kept the dimension to a minimum. 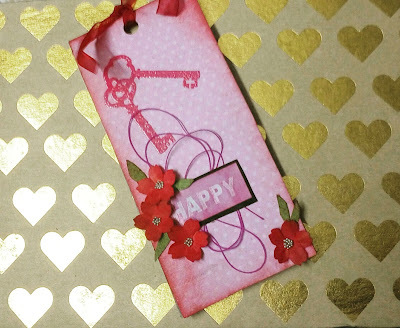 The key stamp is from #itsybitsy, which I embossed using WOW embossing powder. I coloured a thick thread using alcohol marker. And the easiest thing to do here was punching out these flowers and colouring them with red marker. I cut the leaves from a scrap green paper.